In this article we look at the best ear protection for kite surfing in all seasons, this includes winter and spring, the coldest months to kite surf as well as the more comfortable months in summer and autumn. In the UK all year round is seen as cold water kite surfing and keeping your head and ears warm can really improve the enjoyment of the sport and the time you spend in the water. When kite surfing in cold environments, always think about your ears before you go, make sure you've packed your extra layers and ear protection and then the surfing, is all about surfing. You don't have to worry about the cold or big slams and your ears and head will thank you for it. Hitting the water at high speed while kitsurfing can cause a rupture to your ear drum, as well as pain immediate dizziness from exposing the middle ear to cold water can also occur. Regular exposure to cold wind and water can cause bony growths within your ear canal to develop. This can trap water and debris which has the potential to cause a painful ear infection. In some causes when the growths begin to close the ear canal, causing deafness, surgery is required to remove them. The combination of both cold wind and cold water in Kitesurfing increases the refrigeration affect within the ear that causes Surfers Ear. Wearing a kitesurfing helmet really is going to prevent you from getting head or ear trauma. Choose a lightweight helmet will help prevent against any neck problems and make sure it meets the CE Certified EN 1385 Water Sport Safety Standard. If you surf regularly in cold water - custom made ear plugs are more expensive than generic ear plugs but will be a good investment at preventing water entering your ear canal at all, keeping them warm and dry. If you do hit your head or ear while kitesurfing, exit the water and make sure you have not damanged yourself. With all the gear involved with kite surfing you may not want to consider anything else to your equipment repetoire however where your ears are concerned there are only a few adjustments and extra pieces you need to keep kite surfing an enjoyable sport. Wearing a helmet in kite surfing may not be seen as fashionable, may even feel a little claustraphobic or feel as though it reduce your sensory awareness of your surroundings, but with advances in technology and lighter more sophisticated helmets on the market it really is something to look into and we discuss a little about it here. Wearing a helmet when kite surfing helps to protect your head from injury. It is a common incident that while surfing a wave your kite board will charge full force up towards you with a great chance of htting your head. Due to the vast array of pointy points to the board such as the fins, nails and rails these can also leave quite an impression into your skull given the force of the wind and the waves. Many kitesurfing head injuries happen while at the beach when your head hits the floor or a rock. If you find yourself surfing big surf breaks and shore breaks particularly, a helmet could be a life saver and if you are just starting out in the sport as a beginner a helmet will be a worthwhile investment. The MagiDeal safety helmet is made from a rigid ABS thermo-plastic material with 11 ventilation holes. It has an adjustable chin strap with extra padding for comfort and an easy release buckle for ease of use. With kitesurfing you want to have as light a weight helmet as possible so that is does not put strain on your neck when you fall in to the waves. There are a choice of several colour helmet options to match the rest of your kite surfing gear and the helmet meets the CE Certified EN1385 Water Sports Safety Standard. To the back of the helment is an adjustable band so that you can tighten the helmet to make it fit better. Inside you will find a soft foam padding interior. This helmet is medium size fitting a 54-60 cm (21.26-23.62 inches) head circumference. The ear protection for this helmet is a hard plastic that extends down to the base of your ear protecting around the exterior and side of your head against sudden force. It is not going to stop a sudden amount of water going into your ear but it will reduce the trauma exposed to your ear overall, especially if you are heading towards something more solid, like rocks along the coastline or a shallow reef. This is a great helmet that would work well in combination with a good set of ear plugs. The Concept X Kite Surfing helmet is one tough solid build safety helmet with an ABS thermo plastic outer shell and aerodynamic 11 vents through to keep it breathable,. The interior of the helmet is ethylene vinyl acetate (EVA) which is durable, flexible and soft and is designed to reduce the amount of impact. The helmet is one of the lightest on the market at 400g (14.11 oz) which I have mentioned before is an important factor when choosing helmets for kitesurfing. In terms of sizing there are 4 different models you can buy from extra small to extra large. The strap around your chip is adjustable to allow you to secure it tightly and the is further adjustment at the back of the helmet to fully fasten your head in snuggly. This helmet meets the CE EN 1385 Water Sport Safety Standard. The Concept X kite surfing helmet has integrated ear muffs which can be removed (if unnecessary). The ear protectors are made from the same EVA material as the interior of the helmet and reduce sudden impact to the ears as well as a ABS plastic going on the outside . This particular helmets ear protectors fully covers over the outer of the ear except for small vent holes which reduces the sudden flushing ability for water to potentially burst the ear drum with impact while not building up unnecessary pressure inside your ear. The KSP safety helmet weighing in at 400g is another very lightweight well designed helmet! It comes in three sizes small to large and you have the ability to tighten the chin strap and also the adjuster at the back of the helmet to make it fit to your head shape correctly. Make sure you do this before getting in the water. The helmet has a good number of vents to keep it breathable and uses a dual density material that is shock absorbent. The helmet meets the CE EN 1385 Water Sport Safety Standard. This helmet does have ear protection cups that are removable and are ventilated. These ear cups use the EVA material to protect your ears however they do lack a full rigid plastic structure for further impact absorbtion. If you don't like the look of any of the above, check out Amazon for other kite surfing helmet deals. When it comes to finding the right ear plugs, there are many options out there but you need to find the ones specifically designed with kite surfing in mind. For the cheap and cheerful option there are the docs pro plugs (link is external). These are a discreet pair of ear plugs as they are clear, they do come with a leash in case they do fall out you can reel them back in. One of the main reasons ear plugs are important is to reduce the slam of water pressure when you hit the water so you need strong ear plugs. These are made from a hard wearing silicone material . 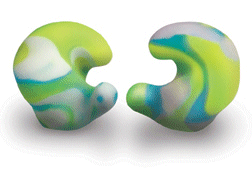 They are washable and reuseable and come in the option of eight different sizes to match your ear size. There are also small vents in the ear plugs to keep the same air pressure inside your ear that is outside your ear and when it comes to kite surfing due to moving from in the air to down suddenly in the water, ventilation in ear plugs is important. These pro plugs also help to keep your ears warm by storing the head's conductive heat and to stop the flushing of water in and out, which will eventually make your inner ear cold. The best solution to protect your ears whilst using a helmet is to get custom fit made ear moulds (with pressure vents). Although these do need you to have an impression of your ear taken, this means the ear moulds themselves will match your ear correctly. An ear impression will take into account each contour and unique bumps and shapes of your ear. If you have tried generic ear plugs and have still yet to find them to seal your ear properly then these are a must for an avid water enthusiast and kite surfer. What you will find is because they match your ear shape correctly they will also be much more comfortable in your ear as well as keeping your ear fully sealed from water. 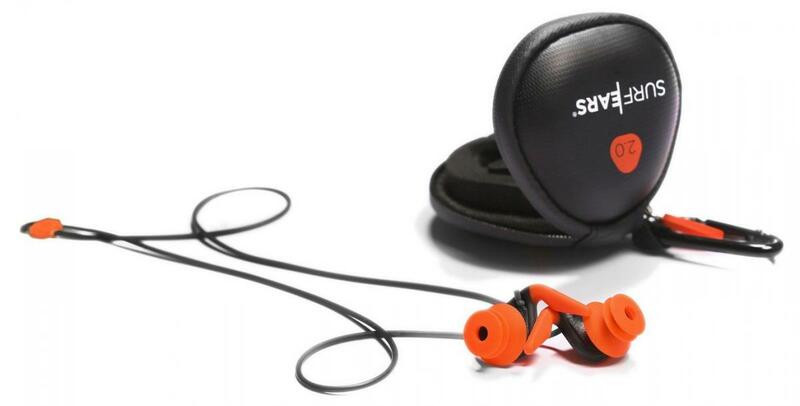 The custom fit also has the ability to stay within your ear better and most custom made ear moulds will come with a lanyard to connect to your wetsuit if they do fall out. The major things to consider with custom made ear plugs is the price and booking yourself in with an audiologist to get an impression taken and over time you will need to have them re made as your ears slowly grow. If surfing is your world then custom moulds really are the way to go paired with a good helmet that protects the side of your head and ears as well as the top.